When we went searching for a bull, we had one major criterion in mind. We wanted a bull that ultimately produced fantastic grass fed beef. Our decision to choose Apostle as our herd sire had some rather exciting confirmation this Week. 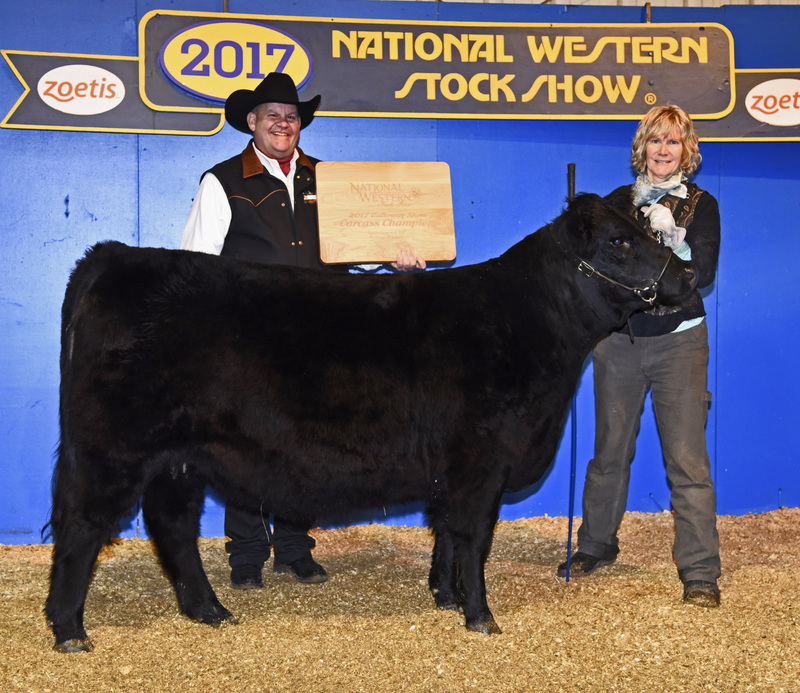 Judy Decker, the previous owner of Apostle, let us know that his daughter Calamity Jane (pictured above) was awarded the 2017 National Championship in carcass quality. This means that when the best of the best Galloway in the entire nation got together to decide which cattle would make the best beef, Apostle's daughter was determined to be the Grand Champion. It is interesting how this is determined. They use a very sophisticated ultrasound system to be able to measure ribeye sections, backfat and even intramuscular fat while the animal is still alive and then make a judgment on the quality of the beef. We were very proud to hear that the progeny of our new Herd Sire had such great results and wait anxiously (about three years from now!) to taste the results of adding him to our herd. If you had to just buy half a pig...which side would you buy? It's like having a meat counter at your house every day! We will be having a set of our very special organic fed and Pasture Raised Heritage hogs going to the Butcher this month. 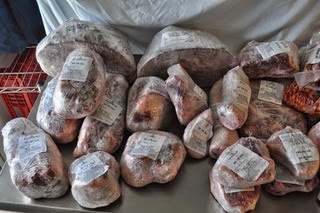 It has been a couple months since we have offered any of our pork in bulk and I know there are several people excited to get their orders in. If you want to buy our pork in the most CONVENIENT and VALUED way, this is your chance! When you buy pork by the half, you get important perks unavailable when you buy it by the cut. The first is price - at $6/# hanging weight, this is the most economical way to buy our amazing pork. You make one purchase at great savings over individual cuts. Perhaps the most important reason to buy our pork in bulk is CONVENIENCE. When you buy an entire half of pork you have essentially done a large part of your meat shopping for several months -- with one purchase. Now, whenever you want to serve your family a very special meal of heritage pork -- all you have to is walk a couple steps to your freezer and pick out the packages that sound the best to you for dinner that night. Another key perk is cut CHOICE. Do you want thick or thin bacon? Do you like your sausage hot or mild? How many chops per package are convenient for you? What about the thickness of your chops? It's your choice! Laura or Jeff will call you and easily walk through the steps to ensure you get exactly what you need for a multitude of meals at your fingertips. The cost is $6/# hanging weight and the typical 1/2 a hog weighs 80-100 pounds. All processing fees are included in the price. We are anticipating the weight of our pigs to be 300 pounds on the hoof. The price you pay for the pigs is not based on this weight, however, it is based on hanging weight. When you buy half a pig, your price would be based on half of that hanging weight. In this example, that would be 108 pounds. The cost of the pork is $6/# based on the hanging weight of the animal. For our typical pig with a hanging weight of 215 pounds, a half would cost $6*(215/2) =$648. Therefore, your final cost on a typical pig would be $6/# of hanging weight = $648 + $30 curing fee = $678. Your actual cost will depend on the weight of the side you order. This will provide most families with a year of pork. We are excited to be able to offer this naturally-raised, woodlot, heritage pork to you & appreciate your support as we have worked to grow this unique product for you. Simply send us an email letting us know you are interested. We will get back with you and find out how you want it cut, how to send in the deposit and arrange for delivery. Your pork will be ready for delivery early-March. It has been an exceptionally beautiful fall, full of nice weather and adequate rainfall. This had made our pastures look especially good as they begin preparations to head into winter. We want a nice, healthy stand of thick grass going into winter because that ensures we have great grass coming into Spring. One of the ways we ensure this is making sure all our pastures get the rest they need to recover from their previous grazing. In our rotational grazing system, the ground has a high degree of impact for a very short amount of time. For cattle, this means they are only on any one particular piece of land for one day before being moved to the next pasture. After one day of heavy impact, the ground then recovers for anywhere from 30 - 180 days before once again having one day of impact. This form of grazing mimics nature and how grasslands were created with the gigantic herds of migrating bison. They would come through an area, eat it down and plow it up with their hooves - but then move on. This periodic disturbance followed by time to rest creates robust and healthy ecosystems. As our cattle herd continues to grow every year, we have begun utilizing pastures around us. It has been so good to find pastures around us that have been untreated and unused for many years and begin to heal them simply with the power of naturally managed grazing. We can then lease this land from our neighbors -- giving previously unused land some real value for land they were not utilizing. There is a fair amount of work involved in moving cattle around to these different pastures, however. Today was one of those days. We needed to gather all of the cattle which were in one pasture about 10 miles away, load them in a trailer and then move them to a new pasture that is directly across the road from our farm. To gather the cattle, first, we have to construct a temporary corral. This is where lots of great pictures would go of the rest of the process. But...as often happens, once the work actually starts, I don't have the presence of mind to pull out my camera. So - I'll be brief in my wordy description. After we put these panels together into a corral, we then bring the cattle into the corral, back the trailer up to the corral and coax the cattle to enter the trailer in an orderly fashion. Sometimes they go in really easily, other times they require lots of patience and persuasion. Our trailer can hold 10 - 12 cattle -- so it takes a few loads to transport the whole herd. Moving the cattle is usually an all-day affair and today was no different. The land they are grazing on now has not been grazed or used for anything for several years. Previously it was CRP grass. CRP is a government program that pays landowners money to allow land to stay fallow for several years. This program is losing popularity and most farms, like our neighbors, are no longer part of the program. They now have land that has been essentially not touched for the last 10 years. I am very excited to see how it reacts to some grazing. The grass there will be nutritious and delicious for the cattle. Our plan is they will be on this pasture for several weeks before moving across the street back to our home farm. Once back on our farm, we will need to start feeding hay as winter will be in full swing. 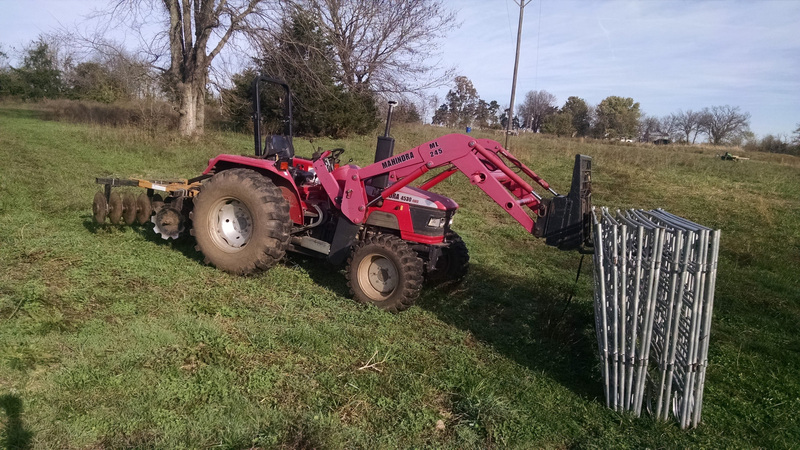 Leasing neighbors land and turning into rich, productive, healthy organically managed pastures is just one way your support as a customer is slowly changing the world acre by acre. By choosing to spend your food dollars on agriculture that supports the world you want your children to grow up in, you are radically affecting the future in a way much more effective and profound than any other form of radical protest. It is time for our annual Fall tour! In past years, it has been our most well-attended tour of the year. The tour will be Sunday, November 20 at 1:00pm. This is a complimentary tour. 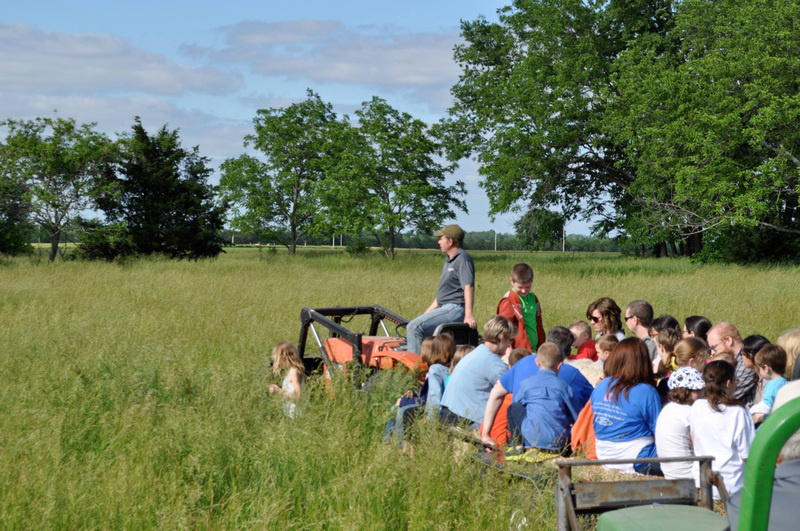 We will take a narrated hayride tour of the entire farm, stopping to see all of the animals as we discuss and educate on the hows and whys of raising our animals in natural environments on the farm. You'll get to see cattle and calves, our beautiful heritage breed turkeys, our pasture raised pigs and piglets, our layer flock of chickens and our pasture raised meat birds. RSVP's will be very important so we can plan to a proper number of tractors and hay bale seats to have ready. Just send us an email to let us know you are coming or you can log-in to facebook and RSVP on our event page. We had a great litter of piglets born this week. Laura and I went on an overnight camping trip with the girls to a nearby lake to celebrate 14 years of marriage. While gone, one of our sows had her piglets. Luckily, Grandpa was dutifully watching the farm and took care of everything. 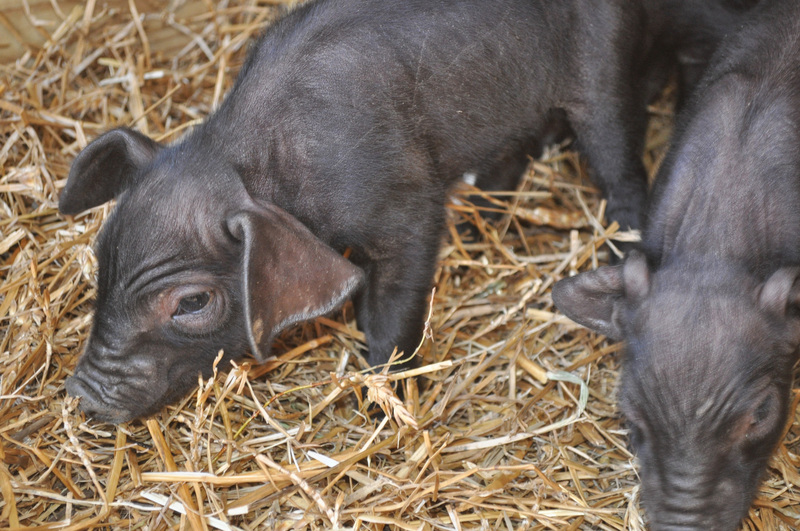 Saturn, mama sow, had 8 piglets that survived the birth and they are doing great. We did have a sad emergency on Sunday -- day 3. One of the piglets had a small wound on its side that had opened up its abdominal cavity and organs that are supposed to be on the inside of its body were hanging out on the outside. It was walking around like nothing had really happened. We decided to give this little fella as much of a chance of survival as possible. So I brought the piglet inside, calling for Laura to come help. We laid our new baby piglet out on the counter and began the delicate work of carefully cleaning each square millimeter of tissue to ensure what we put back inside was what came out -- with no extra dirt or other foreign substances. After we had it all cleaned up, we began the process of gently trying to push the insides in a hole way too small. How did they ever come out? During this process, a good friend and neighbor stopped by. This was fortuitous because she had some experience as a vet assistant and was a very nice gentle set of hands to work alongside with. After getting everything put back in, we sewed him up and laid him in a basket to be safe, rest and heal. Sadly, he only lived about 1 hour after the surgery, but passed away peacefully. The shock of the event ended up being too much for his body to handle. Some people would be surprised to see the care and sacrifice we give to our animals. The very animals we know later we will be eating for dinner. The truth is, it's about respect. We strive to make every day up until the very last day the very best for that animal it can be. Sometimes that means doing surgery on the kitchen counter.